“Water Weavers, The River In Contemporary Colombian Visual and Material Culture” is currently on view at the gallery of the Bard Graduate Center in Manhattan. This exhibition explores the connections between the river and culture exploring the art, craft, and design that has manifested from these connections. A number of the displays reflect the cultural importance of the symmetry in the objects created. 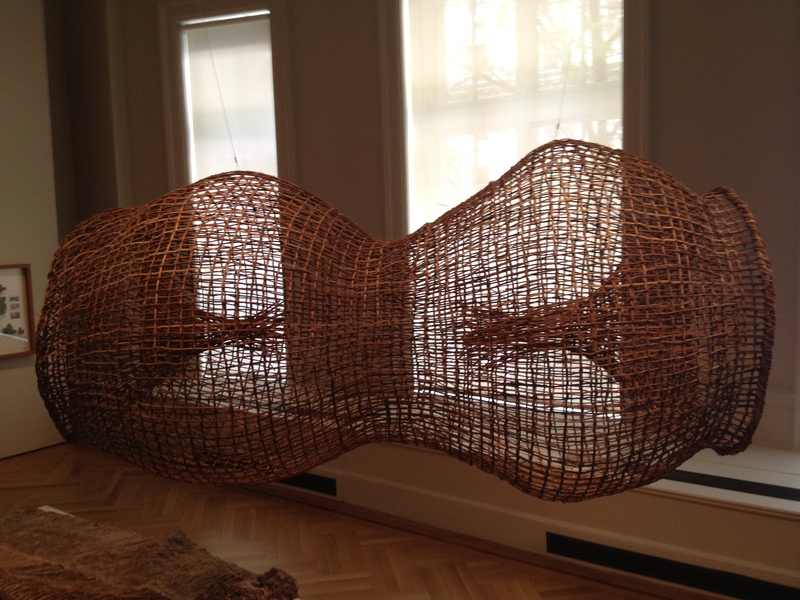 The large scale woven form “Fish Trap” (2013) by Abel Rodriquez was created using Yare’ fiber. This form features 3-D symmetry with a central horizontal axis of rotational symmetry as well as a vertical axis of reflection symmetry. In these weavings Rodriguez has expressed the grace and elegance of form of a traditional and functional object. David Consuegra was one Columbia’s most influential graphic artists. In the 1960’s he developed a series of abstracted patterns based on the esthetics of pre-Hispanic designs. A group of his prints of the individual geometric images are on display in the gallery. Each of these elements of his visual dictionary is based on either reflectional or glide-reflectional symmetry. 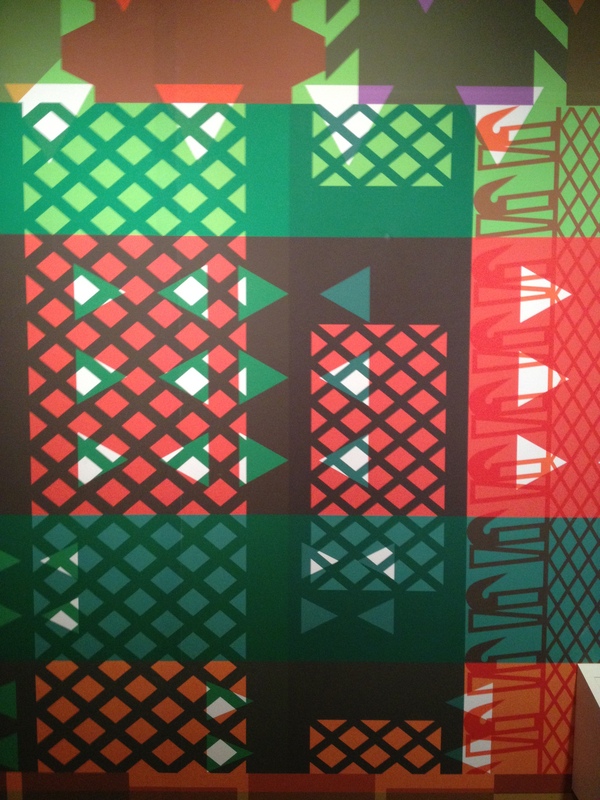 The art collective Tangrama has used technology called “Applique” (2014) to create wall paper designs incorporating the work of David Consuegra. Tangrama has also provided the viewer an opportunity to explore these patterning opportunities with a tablet-optimized web application based on David Consuegra’s designs installed in the gallery. This interactive software allows the participant to layer up to five different patterns with ten color choices, ten gradient variations, as well adjusting size. 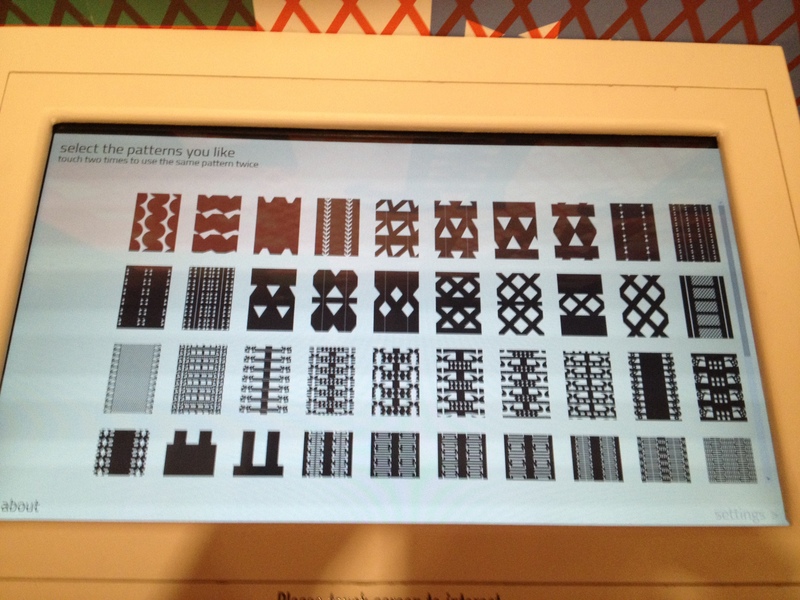 There is also the ability to allow the patterns to move by scrolling across or up and down the screen. I had a great time exploring a few of the multitude of visual possibilities available with this amazing design generator.